Cedar House's handpicked coffee is shipped all over the world. In 1929, Friedrich von der Luhe, a lawyer in the province of Mecklenburg in northeastern Germany, moved with his family to Tanzania (then Tanganyika) to begin a new life. Rates: $110 to $145 per night, including a breakfast of fresh fruit; homemade scones, muffins or breads such as macadamia nut-coconut-pineapple bread, the house specialty; juices; and Cedar Farms' 100 percent Kona coffee. A 10 percent discount is given on stays of five nights or longer in the Pacific Wing, Pikake Rose Room and Ulu Room. Guests in the Hibiscus Suite and Coffee Cottage can enjoy their seventh night free. With the help of his son Reinard and the knowledge he had gained growing grains and potatoes as a side business in Germany, Friedrich started a coffee plantation, which flourished until World War II started in 1939. As Hitler gained power, German nationals were required to give up their ownership rights to land in foreign countries. Friedrich and his family left their coffee plantation and evacuated to Germany. Reinard's love for Africa never waned, however, and he returned there in 1952 to start farming coffee again, this time in Angola. His son Detlef joined a farmers' cooperative in Florida in 1960 to learn marketing strategies that would help boost the business. But a year later, when Angola was rocked by political turbulence, the family abandoned the plantation and settled once again in Germany. Detlef joined the Minden-based Melitta Group and, between 1971 and 1995, served as president of Melitta Pacific Ltd., which sold coffee and coffee-making equipment throughout the Pacific region. Detlef's son Nikolaus represents the fourth generation of the von der Luhe family to maintain close ties with coffee. 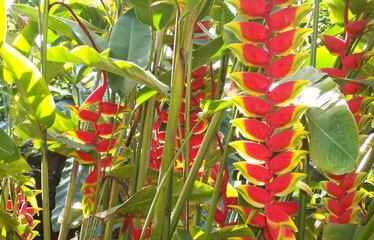 In 1996 he and his wife, Diana, bought a 5-acre parcel in the heart of Kona coffee country on the island of Hawaii. There, at a lush, cool 2,000 feet above sea level, they planted three acres of coffee and lived in a beautiful cedar/redwood home with their four children. Every month, the von der Luhes hosted a few guests who couldn't be accommodated at neighboring bed-and-breakfasts. Recognizing the potential, they decided to create a Web site and spread the word about their property. Within two years business was booming, and they built additional rooms in the house and renovated an adjacent cottage to meet the demand. 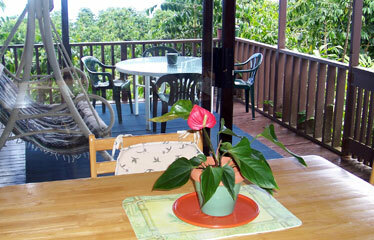 Those looking for an escape to Eden find Cedar House, in Captain Cook, fits the bill. IN THE SUMMER of 2003, Nik's career required that the family relocate first to Germany, then to Hong Kong. Fred and Laura Keener, natives of Palm Springs with more than 25 years of experience bringing conventions and corporate meeting groups to Hawaii, now serve as the hosts of Cedar House Bed & Breakfast and Coffee Farm. Prior to coming to Cedar House, the Keeners had made more than60 trips to the islands on business and were looking for a way to stay. "We thought we might like to run a small inn, and that led me to a bed-and-breakfast site on the Internet," Laura recalled. "I saw Nik and Diana's job posting there; they were looking for someone to manage Cedar House, so we sent them our résumé. They called us within a week and said, 'Please come to the Big Island and let us interview you.'" In July 2005, within a month of that visit, the Keeners were happily settled at Cedar House. They love living in an Eden of fruits and flowers: banana, tangerine, papaya, avocado, lilikoi, loquat, lemons, heliconia, hibiscus, bird of paradise, palms and much more. Laura creates arrangements from vivid blooms she picks from the gardens, and bakes with the bananas that grow in abundance there year-round. "It's nice being in a place that's quiet, serene, removed from the masses," Fred said. "Breakfast is a great time for guests to socialize and make new friends. That homey aspect is something a B&B provides that's hard to get at a resort." Laura added, "We've had interesting guests from all over the mainland, Europe, Australia and Asia. Scientists, astrologers, geologists and professors have stayed with us. Recently, an artist was here; she stood on the deck and sketched the beautiful views." 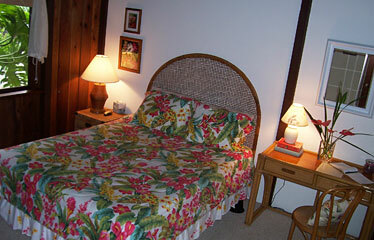 Rooms at Cedar House each feature a private entrance, cable TV, wireless Internet access adn panoramic views of the Kona coastline. Above is the Coffee Cottage. According to the Keeners, most of Cedar House's guests are active; they've done their homework and have a good idea of what they want to do during their visit, which usually includes swimming, kayaking, snorkeling in Kealakekua Bay, stargazing atop Mauna Kea and a trip to Hawaii Volcanoes National Park. The Keeners are happy to recommend outfitters and provide directions to the best beaches. Guests are welcome to peruse the informative guidebooks and brochures in the living room, and if they're looking for a good restaurant, the Keeners have four favorites in the vicinity: Senor Billy's Cantina, Paparoni's Pizza & Pasta, Keei Café (renowned for its fresh catch with Thai curry sauce) and Teshima's Restaurant, which, Fred asserted, "serves the best tempura I've ever tasted." Cedar House's coffee -- handpicked and sun-dried -- also deserves all the accolades it has received. Upon request, Fred leads a half-hour "Coffee 101" tour into the orchard where he explains the coffee growing and roasting processes. Picking usually is done from late October through March. 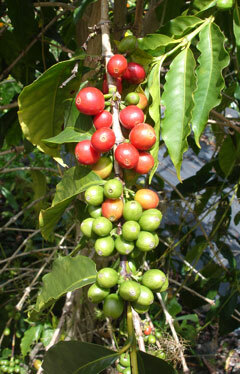 Guests can watch workers gathering the ripe red coffee "cherries," and even pluck a few themselves if they want. It's a tedious task that goes on for three straight days every three weeks during the harvest season; this year's yield is expected to be 26,000 pounds. "One of the nice things is the crew will sing and whistle back and forth to each other while they're picking," Laura said. "We can't see them because they're hidden amongst the trees, but we can hear them and we'll smile and say, 'The pickers are here.'" That good cheer pervades Cedar House, and it's a feeling visitors embrace. In fact, in the past year and a half, the Keeners have welcomed many return guests. "They send pictures and notes telling us what's going on with them and their kids back home," said Fred. "They order coffee throughout the year. Some of them have been here three times; several have been here twice. They fall in love with a certain room, and they book that same room every time." CEDAR HOUSE offers five spacious, comfortable accommodations, each with its own unique decor, private entrance and bathroom, cable TV, wireless Internet access and panoramic views of the Kona coastline and the property's 2,500 coffee trees. The Pacific Wing, Pikake Rose Room and Ulu Room are in the main house. The Hibiscus Suite is a two-story, two-bedroom apartment that occupies one side of the house. It includes a kitchenette equipped with a refrigerator, double hot plate, toaster and microwave ovens, and all the pots, pans and utensils guests need to whip up a great meal. Popular with families, the Coffee Cottage, a separate dwelling 50 yards from the house, offers a full kitchen and a covered lanai for al fresco dining. Guests who normally have trouble winding down because of their hectic schedules tell the Keeners they're able to sleep like a baby when they're at Cedar House. Laura attributes this to the country environs. "It's so peaceful here you can hear the birds chirping," she said. "You can hear the tradewinds rustling the trees. During the summer it can get hot and humid on the coast, but it's always pleasant up here. There are days that are so clear you can see all the way to South Point, about 40 miles away. Cedar House is a wonderful place to escape from real life for a while." Cheryl Chee Tsutsumi is a Honolulu-based free-lance writer and Society of American Travel Writers award winner.